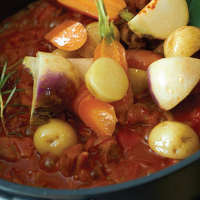 This is the perfect summer stew which really highlights the baby vegetables which are just starting to become available. It is also a great way to use an undervalued cut of meat. 1. Heat a large sauté pan with a lid. Add the meat with no oil, browning on all sides whilst covered with the lid. Remove the meat and pour off the fat. 2. Using the same pan on a high heat, sauté the onions and shallots until soft. Add the bay leaf, thyme, rosemary, coriander seeds, cayenne pepper and stock. 3. Mix completely then stir in the tomato puree chopped tomatoes and garlic bulb. Cover and bring to the boil. Reduce the heat and simmer for 10 minutes. 4. After 10 minutes, blend in the flour, add the potatoes, celeriac, carrots and sugar. 5. Return the meat to the pan. Bring back to the boil and then simmer, covered, for one hour or until the meat and vegetables are tender, stirring occasionally. 6. To serve, check the seasoning and serve with chopped parsley sprinkled over the dish. 2. Scatter the pine kernels on the baking tray and bake for 5 minutes. 3. In a large sauté pan, gently warm the oil and add the grated ginger. Stir, then add the vanilla pod, sage, thyme, garlic and honey. 4. Stir very quickly then add the cocoa powder whilst stirring. Mix in the sweet potatoes and roasted pine kernels. Transfer to a baking tray and place in the oven and bake for 15 minutes, then reduce the heat to 180°C, gas mark 4 for a further 5 minutes, or longer if required. 5. Check that the sweet potatoes are cooked, and serve. Make it vegetarian by replacing the lamb with chunks of aubergine and chick peas.